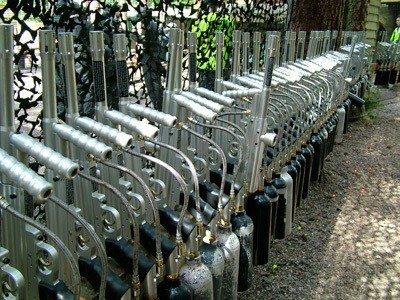 A number of Delta Force Paintball centres in the UK stock the 0.68 calibre Inferno Machine Gun. The Inferno is a rapid, well-finished semi-automatic gun that allows first time players and veterans alike to play with a marker that gives serious accuracy and firepower. Sculpted out of burnished metal, each gun is lovingly maintained by our team of gunsmiths who are proud of their work, and proud to share these amazing firearms with you. If you have any technical questions about the Inferno semi-automatic machine gun please feel free to get in touch 24 hours a day, 7 days a week on 0203 869 9301*. The Tippmann 98 semi-automatic marker is also supplied to customers at a number of paintball centres in the UK. This popular paintball gun is a durable, reliable marker that is easy for players to use. The Tippmann semi-automatic paintball gun is known in the industry to be a solid model that offers incredible accuracy and is light-weight and easy to manoeuvre as it comes with a front grip to aid you in the heat of the battle. For more information about other equipment available at our centres, see our M16 upgrade guns, armour and goggles.